The songs chosen by most of the artists had a thematic connection to the occasion, and the soaring lyrics delivered by the likes of Bruce Springsteen, Mary J. Blige and Justin Timberlake underlined the hope for the country that's coming from around the world. The songs' unplugged, often gentle renditions underscored the seriousness of the situation. Indeed it will: iTunes customers can exclusively pre-order the "Hope for Haiti Now" full-performance album ($1.99) and the full two-hour video telecast ($7.99). Pre-orders will be delivered in the days following the telethon. Individual audio performances will also be available for purchase and download for 99 cents each in the days following the telethon. Apple, the record labels and the artists will donate their share of the proceeds to Haiti relief funds managed by "Hope for Haiti Now" charities, including the Red Cross and Wyclef's Yele Haiti foundation. Performances will also be available for purchase in the days following the event through Amazon's MP3 service and Rhapsody, through distribution provided by INgrooves. Alicia Keys: "Prelude to a Kiss"
The opening number of the night came courtesy of Keys' third album, 2007's "As I Am". The song was written, produced and arranged entirely by the New York-bred singer. The piano-driven number struck a perfect introduction to foreshadow the night's activities. Perhaps that's why the guitar-heavy track, from the band's third album, 2005's "X&Y", starts off so sparsely. Martin's voice soothes the mild strings as the song opens. By the end of the first verse, though, "A Message" builds into a sweeping plea for love and companionship. As Martin met the song's peak, he struck a falsetto turn. Bruce Springsteen: "We Shall Overcome"
This emotional protest song is long on history; it was popularized during the civil-rights movement and its lyrics were derived from a hymn written by Maryland minister Charles Albert Tindley. Springsteen is just one of countless artists who have covered the tune; he did so for "Where Have All the Flowers Gone", a tribute album to the song's credited composer, Pete Seeger. The folk legend heard working versions of the song as a child and later registered it as his own at the behest of his publisher (profits from the rights to the song are donated to charitable foundations). Notable covers stretch wide, including performances by Diana Ross, Mahalia Jackson and folk singer Joan Baez. Dr. Martin Luther King Jr., President Lyndon Johnson and Robert F. Kennedy also memorably made use of the refrain during speeches. Stevie Wonder: "A Time to Love"/ "Bridge Over Troubled Water"
Shakira: "I'll Stand by You"
Mary J. Blige: "Hard Times"
"Hard Times Come Again No More" - written more than 150 years ago by the "father of American music," Stephen Foster - has long been a popular folk favorite for artists looking to strike the careful balance between the celebration of good fortune and the acknowledgment of hard times. The song has been covered numerous times by rock, folk and pop artists, from the late folk icon Kate McGarrigle to Bob Dylan, Emmylou Harris, Johnny Cash and Willie Nelson, as well as another of Friday night's performers, Bruce Springsteen, who performed it live on his 2009 Working on a Dream Tour. Christina Aguilera: "Lift Me Up"
"Driven to Tears" appeared on the Police's 1980 album "Zenyatta Mondatta" and represented one of Sting's earliest forays into writing politically charged lyrics. "Seems that when some innocent die/ All we can offer them is a page in some magazine/ Too many cameras and not enough food/ 'Cause this is what we've seen," he sang. 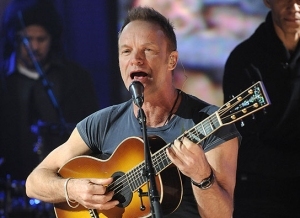 Sting has said the song was inspired by images of starving children he saw while watching television on tour. Plucking the track from her 2009 LP, "I Am ... Sasha Fierce", Beyoncé's "Halo" has become one of her signature songs. Ryan Tedder and Evan Bogart composed the song for B, which is a nominee for Record of the Year and Best Pop Vocal Performance at the Grammy Awards later this month. Sheryl Crow, Keith Urban and Kid Rock: "Lean on Me"
Written by Bill Withers and released in 1972 on his second album Still Bill, "Lean on Me" was inspired by Withers' small-town upbringing in the mining community of Slab Fork, West Virginia - a close-knit atmosphere Withers pined for after moving to L.A. The song hit #1 on July 8, 1972, and remained on the charts for 19 weeks. Despite its popularity, the track did not receive a Grammy until it was re-recorded and funkified by the R&B group Club Nouveau in 1987. The quintet also scored a #1 hit with their rendition. Madonna's "Hope for Haiti Now" performance was filled with respect. Backed by a choir, the iconic singer belted out a hushed rendition of "Like a Prayer." And the song's chorus - "When you call my name, it's like a little prayer, I'm down on my knees, I wanna take you there" - was as inspirational as ever. Jennifer Hudson: "Let It Be"
One of the most covered songs in the Beatles' catalog - and the rock era - this song is the legendary title track of the group's swan-song LP and its accompanying film. Written by Paul McCartney (although co-credited to John Lennon for contractual reasons), the song was recorded in January 1969 but not released until 14 months later. The song was offered to Aretha Franklin, whom McCartney believed would bring out the song's gospel flavor. He was not wrong, and Aretha's version of the song was released two months before the Beatles', on her 1970 LP, "This Girl's in Love With You". The song has been covered countless times in the intervening years - by Ray Charles, Ike & Tina Turner and many others - and McCartney helmed an all-star charity single of the song in 1987 (also featuring Kate Bush and Boy George) to benefit families of the victims of the 1987 Herald of Free Enterprise ferry shipwreck, in which 193 people were killed after the ship capsized off the Belgian coast. Emeline Michel: "Many Rivers To Cross"
Jay-Z with U2's Bono and The Edge (featuring Rihanna): "Stranded (Haiti Mon Amour)"
Produced by Swizz Beatz and tweaked by The Edge, this high-powered collaboration was created over the phone when the hip-hop beatsmith and Bono came up with the chorus together. Hours later, Hov - who helped conceive the effort with Swizz - jumped on the phone and got wind of the melody. "I knew that Jay would be able to tell a story," Swizz said of the track. "And that Bono would be able to sing and bring it home." Rihanna completes the lyrical trifecta. "The last component that I added was Rihanna, and she's kinda like the angel that's on the track, softening it up and giving it that caring feeling, because this hook is so powerful." Dave Matthews & Neil Young: "Alone & Forsaken"
Emmylou Harris covered the song on that compilation, capturing its isolation - as did Dave Matthews and Neil Young, whose performance underscored the seriousness of "Hope for Haiti Now." Wyclef Jean: "Rivers of Babylon"
After a night of stirring performances, it was only right that Wyclef Jean closed out "Hope for Haiti Now." The Haitian-born star - who immediately traveled to his homeland in the aftermath of the earthquake and has raised millions of dollars for relief efforts - delivered a moving rendition of the reggae classic "Rivers of Babylon." The biblically inspired "Rivers" was written and performed by Brent Dowe and Trevor McNaughton of the Jamaican trio the Melodians in 1972, and it was included on the soundtrack to the classic Jamaican crime film "The Harder They Come." Its lyrics are based largely on Psalm 137, which details the Jewish people's despair after being exiled from Jerusalem by the Babylonians. A 1978 cover version of "Rivers of Babylon" by the disco group Boney M hit #1 in the United Kingdom and stayed there for five weeks; it peaked on the U.S. pop charts at #30. Sublime's 1992 debut "40 Oz. to Freedom" featured a live version of the track, which has also been covered by Paul Simon and Sinead O'Connor. "Let the words of our mouths and the meditations of our hearts be acceptable in thy sight here tonight," 'Clef sang. That meditation, taken from Psalm 19, seemed like a fitting epigram for a night filled with appeals for awareness and assistance. iTunescustomers can exclusively pre-order the "Hope for Haiti Now" full-performance album ($1.99) and the full two-hour video telecast ($7.99). Pre-orders will be delivered in the days following the telethon. Individual audio performances will also be available for purchase and download for 99 cents each in the days following the telethon. Apple, the record labels and the artists will donate their share of the proceeds to Haiti relief funds managed by "Hope for Haiti Now" charities, including the Red Cross and Wyclef's Yele Haiti foundation. Performances will also be available for purchase in the days following the event through Amazon's MP3 service and Rhapsody, through distribution provided by INgrooves. © MTV.com by Jayson Rodriguez, with Jem Aswad, Maura Johnston, Gil Kaufman and Amy Wilkinson.